How do you feel about having a pizza for breakfast? Don’t worry, it’s not the regular pizza, this sausage gravy pizza is healthy and yummy! Check it out. 2 packages of crescent rolls. 1 package of Jimmy Dean cooked sausage crumbles. 1 envelope of country gravy mix. 8 oz of shredded cheddar cheese. 4 oz of shredded pepper Jack cheese. In a greased round pizza pan, place the dough after separating the crescent rolls into 16 triangles (the points toward the center). Form a crust by pressing onto the bottom and up the sides of the pan seal the seams and bake for 11 to 13 minutes in a preheated oven to 375°. In a medium saucepan, cook the gravy according to the package instructions. Add in the sausage crumbles and mix. Set aside. Mix together the eggs, milk, salt and pepper in a small bowl. Melt the butter over medium heat in a large skillet and cook in the egg while stirring. 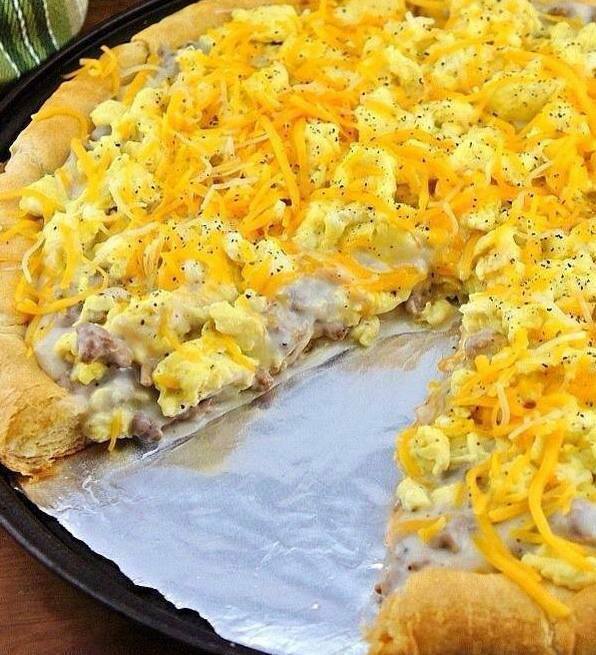 Now, top the crust with the sausage gravy sauce then add the eggs and cheeses.